eXplore Brown County offers 15 world-class zip lines, the Fastest, Longest and Tallest Twin Racing Zip Line in Indiana! Soar over a mile of cable from heights of 20’ to 70’ through treetops, over hollows and our lake. The zips incorporate trees and poles, with a mix of both ground and elevated take-offs and landings. The length of the zips range from 80' - 1220' and include tower rappelling, side-by-side zips, scenic tree towers and The Screamer! a 1/4-mile 1220' zip, an adventure you won’t soon forget! 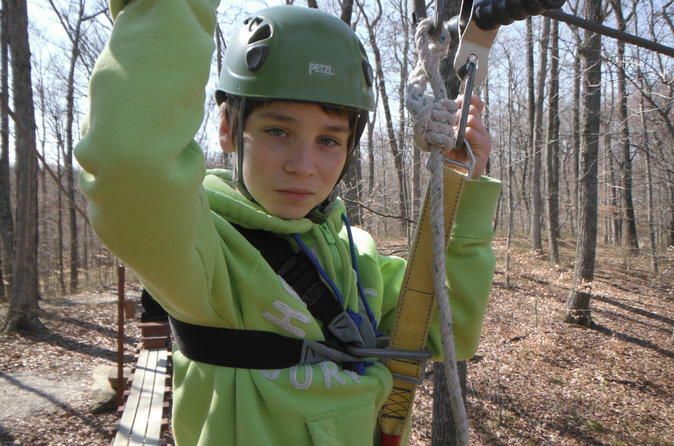 THE PREMIERE EXPLORER Zip Line Tour is for the full adventure enthusiast! Included are 5 zip lines, ranging from 400-600 ft. reaching heights of 80 ft. as you zip across our lake 3 times! Also included are two sky bridges, you'll finish with an assisted rappel from the final platform! The Zip On Tour is for those who might be nervous, but still want that high adrenaline rush! This tour starts with 3 "warm up" zip lines to give you a taste, but after that you'll experience the adrenaline rush of the longest and fastest duel racing zip line in Indiana! After this 1200ft line you'll finish the tour with a line where gravity will help you glide forwards and backwards until you come to a stop in the middle!